How many of you start your day thinking ” I should start my diet from today”? I guess there will be at least 7 out of 10. And I have to include myself too. After marriage it was like a new freedom to me, as a matter of fact for every girl out there. Being newly wed, the love is still fresh in the air. Husband still sees his wife as the queen of his fort. Pampers her with flowers, cakes and chocolates, trying to win her heart each and every day. And the newly wed wife gets carried away, with her strict mom, to say no to the “fat and sugar” food, no where around. She splurges on all the goodies. And as time passes by, as the eyes and mind get cleared and as the couple recover from the love bug the damage is already done. This was the same with me, after 6 months, when my jeans started to get tighter, when favorite top got torn when trying to put it on, I stepped on to the weighing machine. And I had a major shock. I did not even realize when I put on all the extra pounds – the love pounds. And from that till date, I have been on numerous diets, trying to get back to my weight before marriage. Being a food lover and food blogger this is getting more and more impossible. As usual I started my mission “Diet” once again, and let me see how will I manage this time. 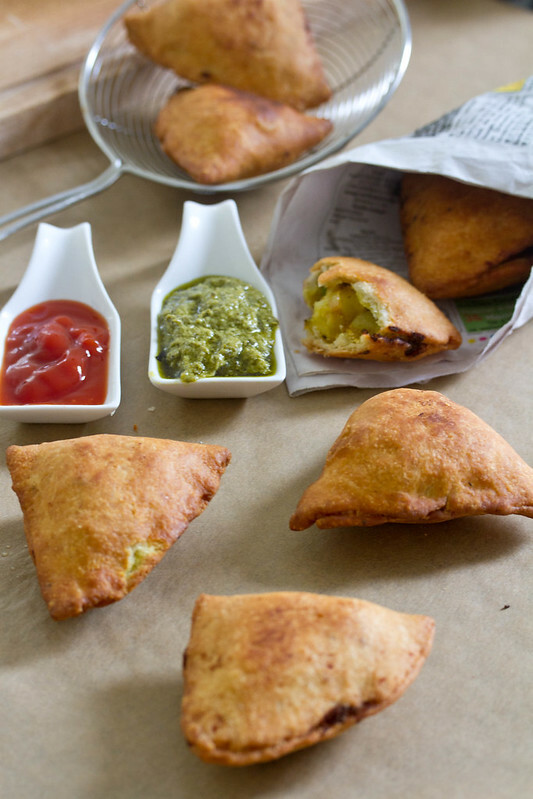 So before starting the diet, why dont we pamper ourselves with the most delicious street food – Samosa! I love the Samosas made by my mom, especially on cold rainy days. By the time I came back from college and as I stepped into the house, I used to smell the wonderful freshly made Samosas. As I passed through the kitchen I could hear the oil sizzling every time Mom dropped them in hot oil for frying. Unable to resist myself, I used to sneak behind her and grab the piping hot samosa, which she just removed from oil. My mom, surprised to see me behind her, pretending anger, playfully to tapped on my back. Then I would snuggle beside my dad in the living room, taking a bite into the crispy shell of the pastry. It would be a burst of flavors in my mouth, crisp shell, with potatoes and peas delicately spiced with ginger, garlic and fresh herbs. Mix the flour with salt, semolina, oil and ajwain. Now slowly add water in small amounts to make a pliable dough. Less the water, better the dough. Once you get a nice stiff dough, cover and let it rest for 15 – 20 mins. When they pop, add the ginger, green chili and onion. Fry till onion turns golden. Now add turmeric and coriander powder. Add in peas. When peas are cooked add salt and mashed potatoes. Mix well. Lastly add lemon juice and coriander leaves. Turn off heat. Cut the big circle into two semicircles. Dip your finger in water and rub it at the straight edge of the semicircle to make it wet so that it can stick. Fold this semi circle into a cone shape. Seal it along the fold. Take about two spoons of potato mixture, and spoon it in to the cone. 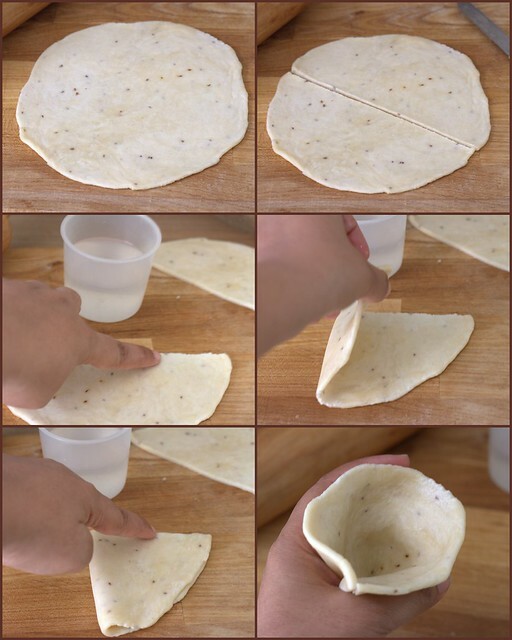 Wet your finger and run it along the edges of the cone to seal.Press the ends firmly so that the filling does not come out during the deep frying process. Heat enough oil in a wok to deep fry the samosas. The oil should be warm but not smoking hot. Frying the samosas in hot oil makes the outer crust soft, which is not advisable. 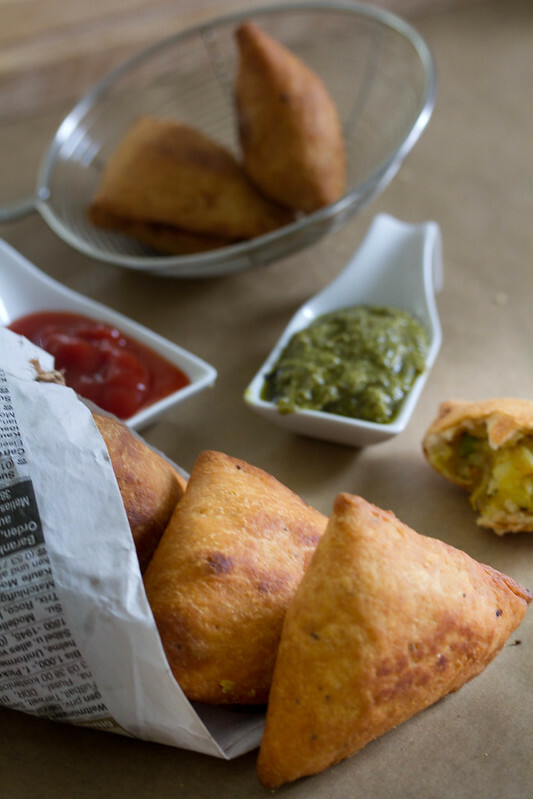 Drop the samosas one by one or 2-3 at a time into the oil slowly and deep fry them till golden brown. Be careful while kneading the dough, use very little water. Adding water little a time is helpful. While frying keep in mind that oil should be warm, and slowly increase the heat to cook the pastry well. Never fry in smoking hot oil. I have tried to make my first video illustration. I hope you guys will like it. Any inputs and suggestions are welcome. Hey…making me hungry :), yummy samosa’s with nice presentation, easy to understand!!! Oh yeah i know my hubby says he gained few kilos after the samosas i made, after getting married, as i didntlike the food here and i use dto make so much samosas and he used to love it too,but mine never comes so perfect as yours. They look super yumm. 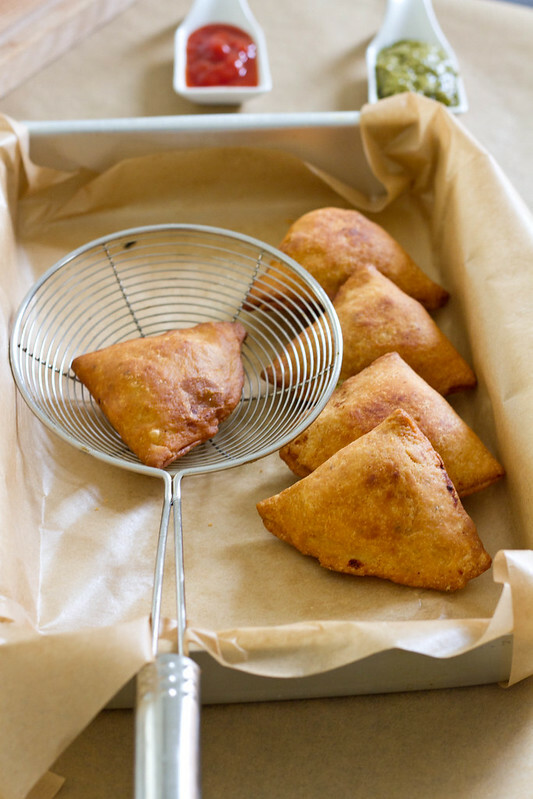 wonderful crispy and tempting samosas with step by step demo. Nice mouth watering dish for this rainy day. Here it is raining and i found ur recipe . Nice timing dear. 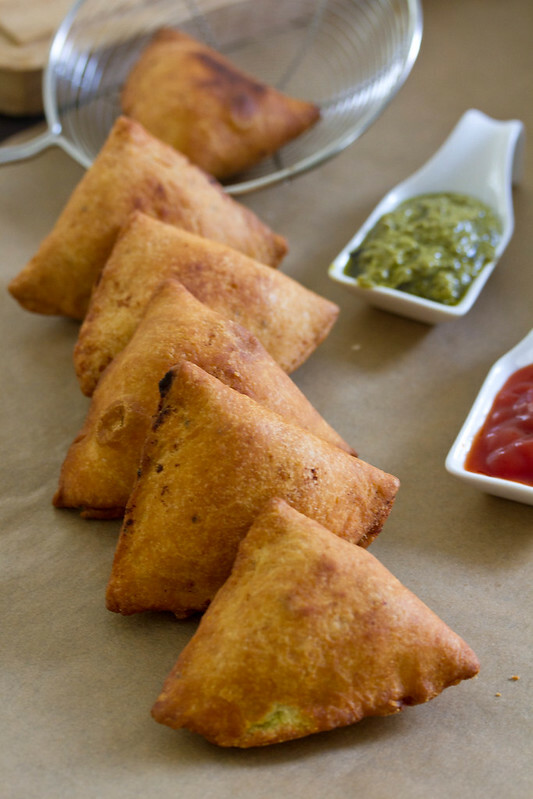 Mouthwatering samosas! The step by step photos are very informative. Will definitely refer this one on a ‘feel like a samosa’ day! Your samosas look delicious. Great photos! I find your video very illustrative. Especially the part about filling the samosa! Well done! I only have one remark: I would have loved to see the picture at the end for a few seconds. What a great post – beautifully written. I love the concept of “love pounds” – and I think we all suffer a bit from them!! 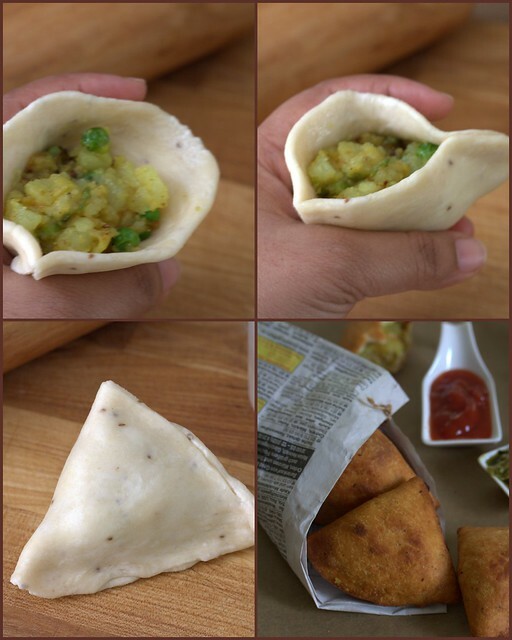 Gorgeous step-by-step pics of making samosas too – thank you!